The first time you install a card each turn, gain 1credit. Oh hi, didn't see you there. New to HB, aren't you? Let's take a walk. You know, when people start here at EtF, they often ask us the same things - 'Why the robots? ', 'What do we do, exactly? ', and 'Did that woman with the drinks just look at me funny?'?'. To that last point, no she absolutely did not. Stop worrying, calm down and relax in the pool later or something. To the other points I will answer you with this - we manage time. The old saying goes, 'time is money'. No, 'money is time', and here at EtF we make one so that we can properly harness the other. We do this by ensuring that the financial capital we need is generated by our most simple daily tasks. Start a new project? Capital. Improve our defenses? Capital. Nearly everything you do will contribute to our efforts as a whole, and you will find that the funds you may have needed to finish a project will have been saved ahead of time by simple, regular work. Imagine, if you will, a new line of physically appealing manpanions are scheduled for release. Money is tight. Time is tight. In a different branch you might have to decide between making the deadline (but leaving them vulnerable to vandalism), or delaying their release for the sake of ensuring company secrets are protected. Not with us. With us, you can install those defenses and use the money gained from that to release them on schedule. Perhaps you're a little short on scratch for your next (ahem) financial side project? Normally you would have to slow things down to get in a position to benefit from such things. With us it doesn't matter. Keep doing what you do, and you'll find the means to make money are available far more often (more than you would think) without distraction. EtF will only give you the 1 once a turn, but is available from the start, requires no upfront investment, and will in most cases remain a guaranteed nudge to your credit balance until the end of the game. One other way of looking at its benefits - it essentially lets you install a second layer of ICE for free. Out of all the core set Identities, Engineering The Future was one of the strongest, and remains so. Along side Weyland Consortium: Building a Better World it pushed one of the earliest aspects of the meta - Corporation economy dominance. The single credit may not seem like much, but it is reliable, and like several runner cards, allowed a compression of actions. The corp is going to be installing anyway, right? To be able to also gain a credit in the same click helped keep the corp running smoothing. Efficient almost. ETF remains strong even into the current meta, being a typical choice for a lot of HB Fast Advance style decks. 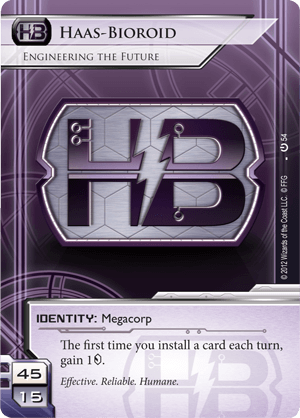 It remains strong and impactful even to the point where most HB deck lists that pop up on the internet are often challenged with the line: “This would run better out of ETF.” That makes this one of the more dominate identities. No other identity within HB has had dominance at all in the metas, though fringe cases may occur. Only Cerebral Imaging: Infinite Frontiers has even come close; however even those decks are mostly combo decks relying on putting many pieces together. This dominance might have a limited scope with some of the upcoming spoiled identities for HB, but even so, how many decks presented in any of these identities will be challenged with ‘This would be better in ETF’? The smoothing out of the economy, even if it is no longer a dominance like the days of just the Core Set or a few data packs, remains a strong and viable ability.